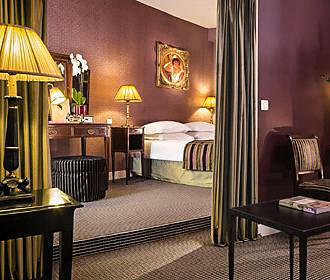 Located in a historical area within the 6th Arrondissement of Paris and close to the River Seine and the Ile de la Cite, this 3 star hotel has 24 hour reception and concierge services, room service, breakfast, free WiFi, luggage hold, laundry and dry cleaning, international newspapers, connecting rooms for families and games for children, plus much more. This three star hotel is located within a historical area of the city on a street that was named after a quote that King Henri IV was meant to have said about his mistress who lived there, which was "Here lies my heart" and in French this is "Ici git mon Coeur." The hotel is decorated in a very traditional French style with antique furniture and along with beautiful paintings adorning the walls and has a 24 hour reception with multilingual staff plus a concierge service for restaurant reservations, booking tickets to museums, shows, and much more to make your stay run smoothly. Breakfast is served at the reception of the hotel from 7am to 11am and you can choose between an Express breakfast for approximately €8 that has a hot drink, a croissant from the famous Gerard Mulot bakery and a fruit juice. Alternatively you can opt for the French Classic breakfast, which is a cost of approximately €15 and includes Portioli Italian coffee, Pastries from the famous Gerard Mulot bakery, fresh croissant, baguette and pain au chocolat delivered every morning, fromage blanc with rasberry coulis, a choice of muesli or corn flakes, fresh fruit salad, choices of ham and cheese and varieties of jams plus fruit juice. When it comes to lunch or dinner you could enjoy the Cafe Latin, which is located on the corner next to the Hotel Residence des Arts, plus this 3 star hotel also offers room service from noon until 11:30pm for the bistro style classics that this restaurant has to offer along with drinks including a vast selection of French wines. Other services at this hotel include free unlimited WiFi, international newspapers and luggage storage for those of you who arrive early or wish to leave later and get the most out of your holiday in Paris. In addition to these facilities for additional charges there is a laundry and dry cleaning service along with airport transfers and even private concierge services, plus you can request specific welcome gifts such as champagne, chocolates, etc that would be within your room awaiting your arrival. 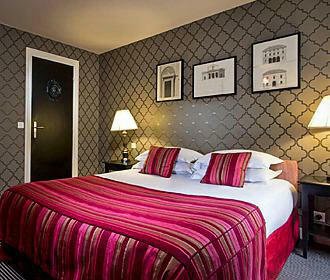 Each of the rooms at the Hotel Residence des Arts comes with air conditioning and heating depending upon the time of year, also being soundproofed, they have an en suite bathroom with a hairdryer, magnifying mirror, complementary toiletries and bathrobes plus slippers are available upon request. Decorated in a traditional style with comfortable furnishings wallpapers by some of the top French and international houses along with antique furniture, each has a work desk and lamp, a flat screen TV with cable and international channels, free unlimited WiFi, a mini bar and a personal safe, plus an iron and iron board are available upon request, as is a crib or baby cot if requested at the time of booking. The Double rooms are approximately 15 to 17 metres squared and come with a queen sized bed, with the en suite being a sensible sized shower. 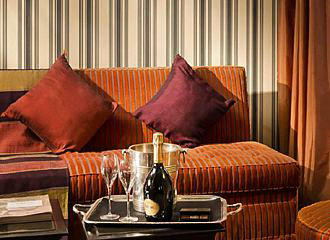 Whereas the Junior Suites are a good size for this type of room in Paris at between 35 and 40 metres squared, coming with a king size bed plus a sofa bed in the living and dining area that also includes a basic kitchenette, and the en suite has a bath as well as a separate shower for added comfort. There is also an Apartment that consists of a double room and junior suite connected, which provides accommodation for up to six people with a queen bed, king bed and a sofa bed. This also means that there are two bathrooms, one with a shower and the other with a bath and shower, plus the living and dining area also includes a basic kitchenette. When it comes to getting to getting to the Hotel Residence des Arts, you will find it located within the 6th Arrondissement close to the River Seine and many popular tourist attractions in Paris in between the Saint-Germain des Pres and the historical Latin Quarter areas of the city. This hotel is also linked to the Cafe Latin and is positioned just up the road on the opposite side from the 4 Star Hotel Villa d'Estrees which is also partnered with this 3 star hotel and the bistro restaurant. 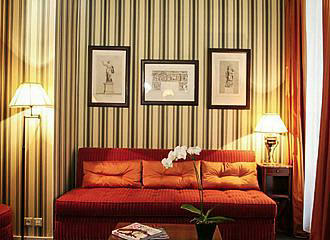 However we would like to point out that unfortunately the Hotel Residence des Arts is not accessible to the disabled. But as for the public transport in Paris, you will find that the nearest Metro station is the Saint-Michel - Notre-Dame stop serving Line 4, however, this is also an RER train station serving the RER B Line and the RER C Line. Alternatively, in the opposite direction you have the Metro station called the Odeon stop serving lines 3 and 10. Yet the Bus Lines 21, 27, 38, 58, 70 and 85 along with the Noctilien Night Bus Service via Lines N14, N21, N122 and N145 will also get you within walking distance of this hotel.